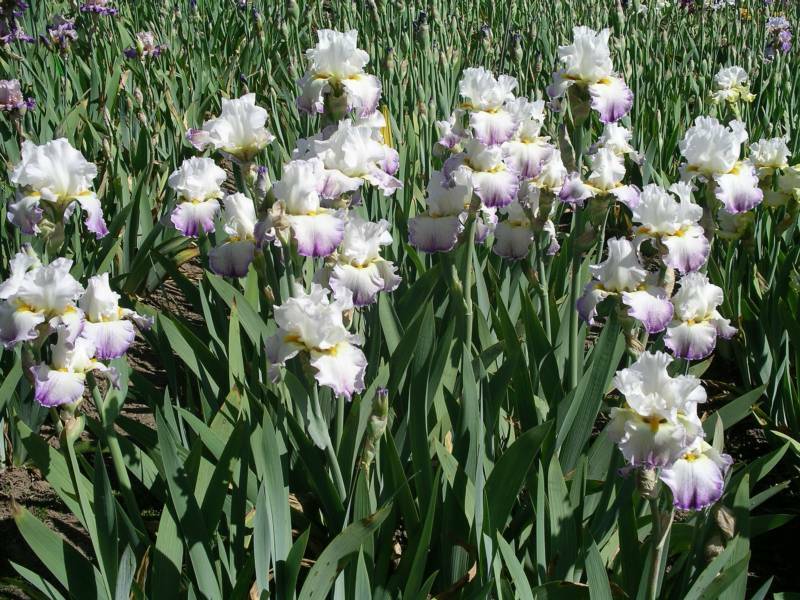 Offering the best new irises for the connoisseur and for the backyard gardener. Bruce Filardi started hybridizing in 1996. 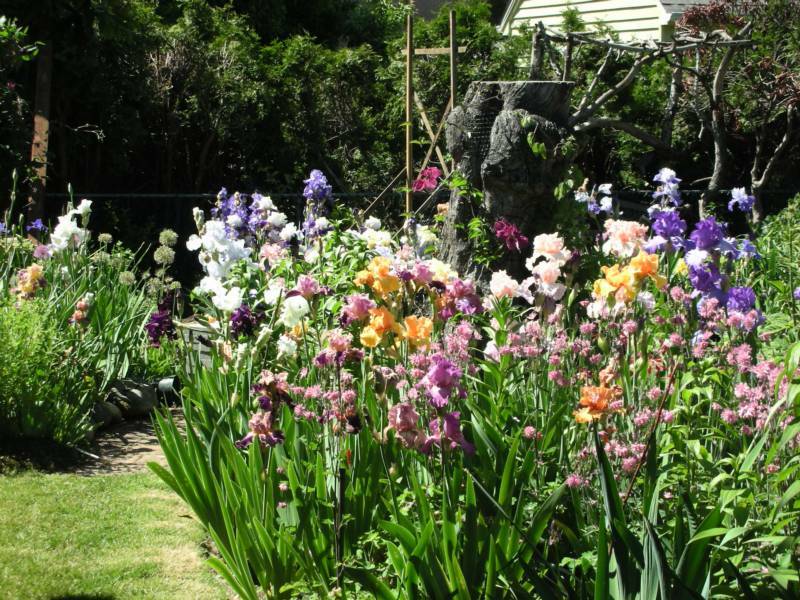 As soon as he fell in love with irises, he fell in love with hybridizing. His first inspiration was when he had a day off from work one day in May of ’95, saw an ad for Schreiner’s, and hopped in the car to drive an hour south from Portland to Salem. Instead of the casual half-hour visit he expected to make, he spent several hours there with his camera, first in the display gardens and later wandering through the seedling fields. The range of colors and patterns was mesmerizing, and the first thing he wanted to breed was a green iris. Bruce speaks German so was able to communicate with German hybridizer Manfred Beer, who speaks no English. He finally had the opportunity to meet Manfred and friend Margitta [“Gitta”] Herrn, along with German hybridizer Günter Diedrich and his wife Rosi, at the National Convention in Portland a few years ago. Two years later, Bruce was the guest of Manfred & Gitta in Germany, where he got to see the Diedrichs again, and also met Wolfgang & Barbara Landgraf. An inveterate traveler, Bruce had also met and visited Anton Mego and his wife Viktoria on a trip to Slovakia; and when he was invited to judge at the International Iris Competition in Florence, Italy, he met Lorena Montanari and her husband Giorgio. On all these occasions, as happens when fanatic hybridizers get together, seedling photos were shared and discussed. Bruce saw many striking and worthwhile irises which he knew would never be seen in America. International Iris slowly came into being as a way to distribute Bruce’s own work, and more importantly as an outlet for the work of Europe’s great hybridizers who really had no distribution process. 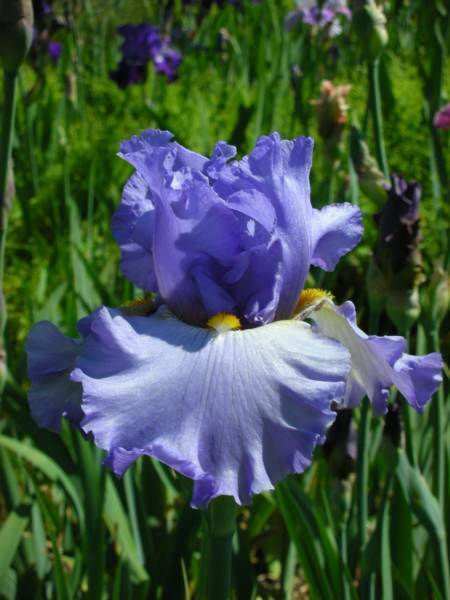 In 2009 and 2010, irises were introduced by Beer, Diedrich, Filardi, Landgraf, Mego, and Montanari. The most popular in 2009 were Landgraf’s ‘Landgraefin Elisabeth’, Montanari’s ‘Ferragosto’, and Filardi’s ‘Crest of the Wave’. In 2010, the favorites have been two from Mego, ‘Bratislavan Prince’ and ‘Zlatovláska’. In 2011, new hybridizer Cynthia Bauer (Portland, OR) has her first two introductions, and in 2012 he hopes to showcase the work of two additional American hybridizers. Please note that supplies are limited on all new introductions. in Florence, Italy, in 2014! Please watch for these new introductions in the display gardens at the American Iris Society National Convention this year! My post box was supposed to renew automatically each year, charged to my credit card. For some reason, that didn't happen this year, and I just found out today that my po box had been closed. So please use my home address for now. Thank you! excellent form and stunning color!